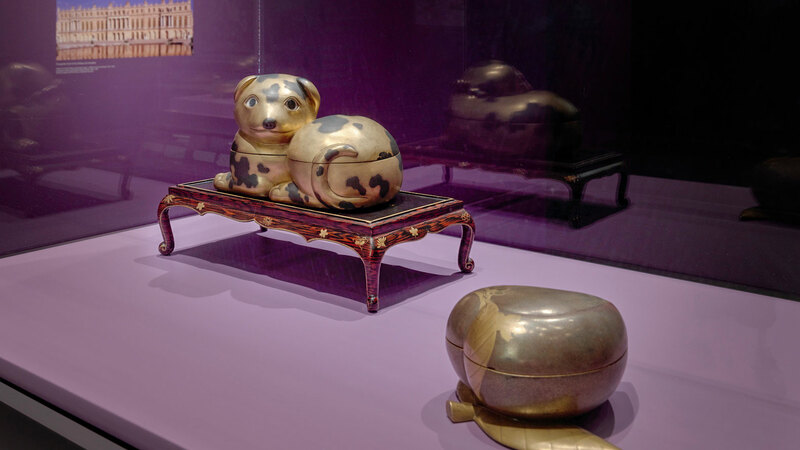 The lacquer box in the form of a small dog is one of the most popular objects in the exhibition A Queen’s Treasure from Versailles: Marie-Antoinette’s Japanese Lacquer at the Getty Center until January 6, 2019. Such zoomorphic items in Japanese lacquer were highly coveted by collectors during the eighteenth century, and Marie-Antoinette’s example was evidently one of her favorite pieces. In her private sitting room at Versailles, the royal palace just southwest of Paris, she placed it in a prominent spot on a table veneered with petrified wood and ornamented with gilt-bronze mounts next to the fireplace. There, visitors would not be able to escape noticing it. The queen’s guests would have wondered, as we do, how such an extraordinary object came to Versailles. The box has had quite an exciting existence, as is evident by tracing its history from the time it was made in Japan. Like other items in the queen’s collection, the dog-shaped box and the small stand in the form of a low table upon which it rests are a type of high-quality Japanese lacquerware that was made primarily in Kyoto for sale to members of the Japanese upper class during the late seventeenth to mid-eighteenth century. These small lacquer objects were very expensive, and many originally would have been made as parts of larger sets. 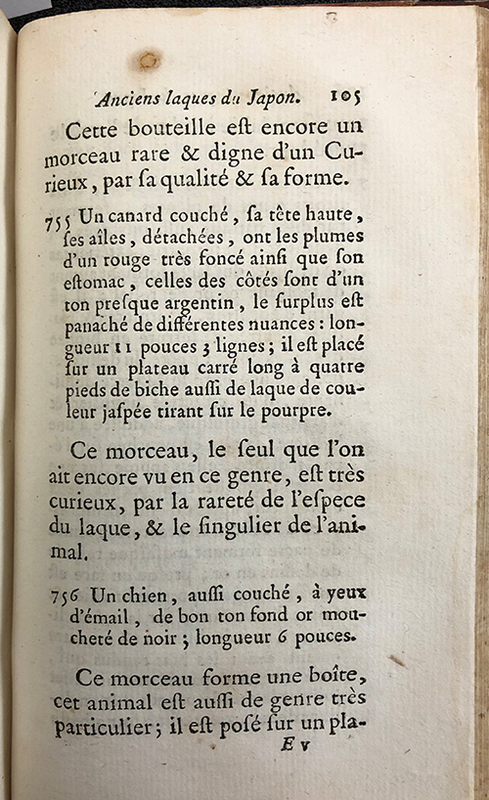 Apparently, some merchants would acquire ensembles from the lacquer workshops and then divide them into individual elements to sell separately abroad. This was probably the case with this dog-shaped box and low table. No similar ensemble is known, so it is likely that the individual pieces were grouped together at some date before 1777, when they appear together in a French auction. From Kyoto, the box and low table would have been transported to Nagasaki harbor, and from there shipped overseas by Chinese or Dutch merchants, at the time the only nationalities permitted to trade with the Japanese. 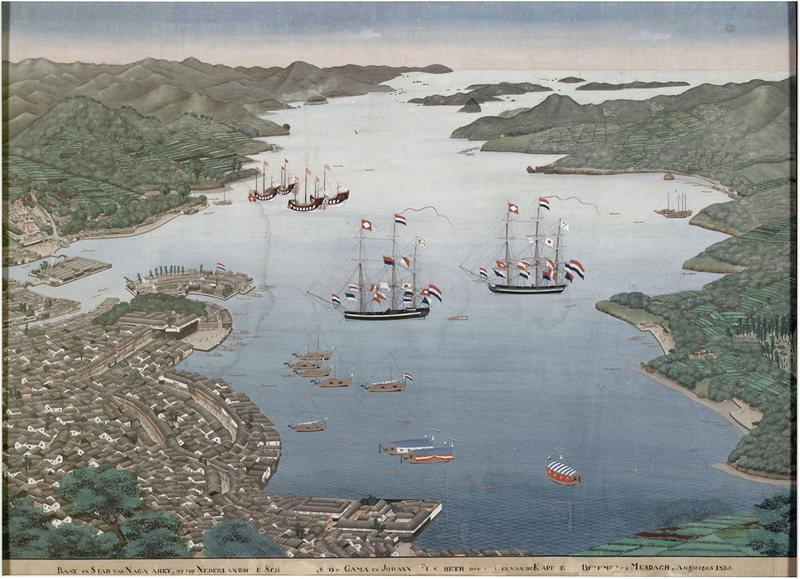 The volume of the Chinese trade with Japan was the largest, and it is likely that they bought lacquer to sell at other Asian ports such as Macao in China (near present-day Hong Kong) and Batavia (present-day Jakarta) in Indonesia. From any of these ports, the pieces would have been acquired by a European merchant and then sent on the long voyage across the Indian Ocean, around the southern end of Africa, all the way up the Atlantic Ocean, and through the English Channel to a European port such as Amsterdam. 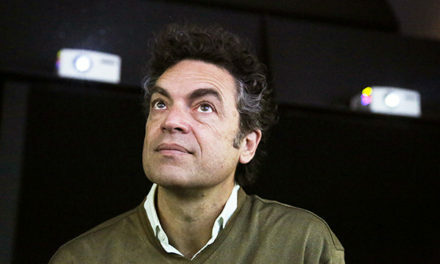 The trip could take over a year, at the end of which the box and low table would have been acquired by a dealer in luxury objects for sale to members of the European upper class. 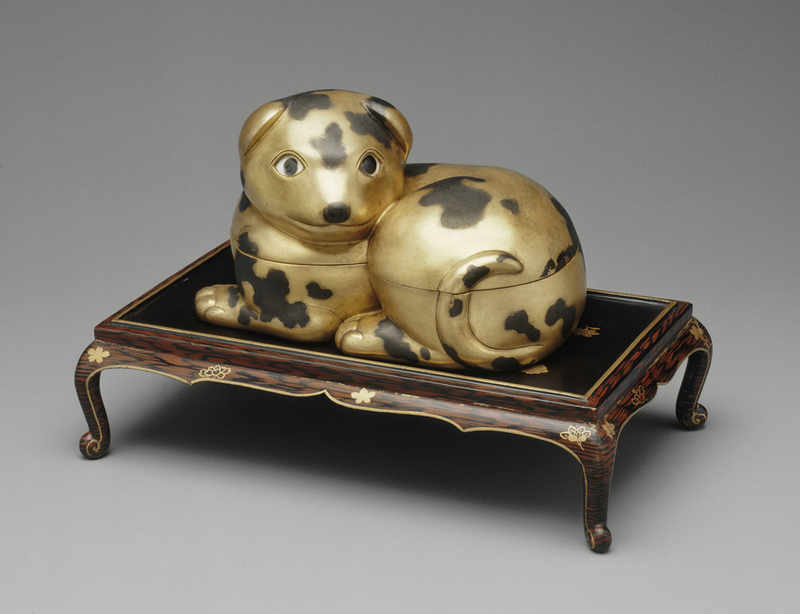 The dog-shaped box and low table arrived in Europe by the mid-eighteenth century. They could have been owned by one or two different private collectors before being acquired by Pierre Louis Paul Randon de Boisset. This financier was one of the most prominent French collectors of the time. He began buying art in 1752 and by the time of his death in 1776 had assembled a large collection of 33 pieces of “precious old Japanese lacquer,” as they are described in the sale of his property in Paris the following year (February 27, 1777, and ensuing days). There the dog-shaped box and its accompanying low table are described together in lot 756. 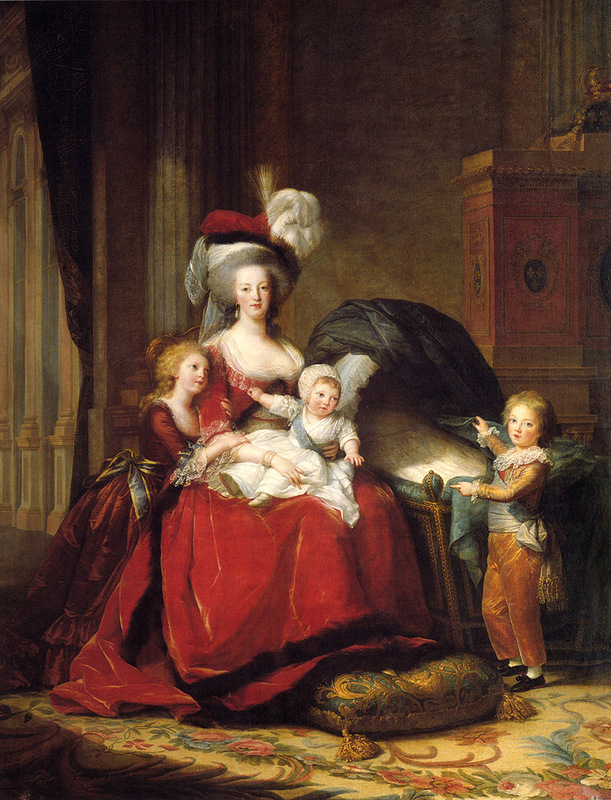 In November 1780, Marie-Antoinette’s mother, Empress Maria Theresa of Austria, died in Vienna. The empress left almost the entirety of her prized collection of Japanese lacquer to her youngest daughter. Once her mother’s legacy of 50 small boxes arrived in France, Marie-Antoinette was so taken with the collection that she added about 30 pieces to it over the next eight years. Among her additions were the dog-shaped box and low table. These would have been acquired by a French dealer of luxury objects at the Randon de Boisset sale and subsequently sold to the queen in the early to mid-1780s. 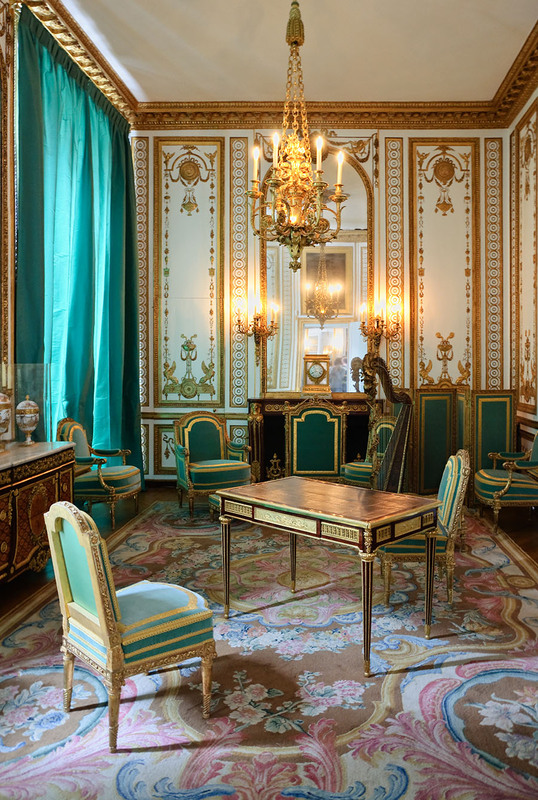 Marie-Antoinette had her private sitting room in Versailles, the cabinet doré, redecorated specifically to showcase the precious works of lacquer. She commissioned the Parisian cabinetmaker Jean Henri Riesener to supply a suite of furniture set with panels of Japanese lacquer to compliment her collection of boxes. This included a specially designed glass display case with nine shelves to house most of the pieces. The display case has not survived, but a few of the other pieces have, for example, the extraordinary drop-front secretary now at the Metropolitan Museum of Art in New York. A few favored works, such as the dog-shaped box, were placed on the tops of small tables dispersed around the room. In this sumptuous and intimate setting Marie-Antoinette could retire from the stress of being in the public spotlight and relax with family and friends surrounded by objects that were most dear to her. This tranquility was shattered when, on October 5, 1789, a Revolutionary mob invaded Versailles and forced the royal family to move to Paris. Five days later, Marie-Antoinette asked a trusted art dealer to return to the palace and collect some of her most treasured possessions—chiefly, the lacquer boxes. Because of the quick action of the art dealer, Martin Éloy Lignereux (an associate of Dominique Daguerre, a prominent luxury goods merchant in France at the time), the lacquer collection was carefully packed and sent to Paris for safekeeping. 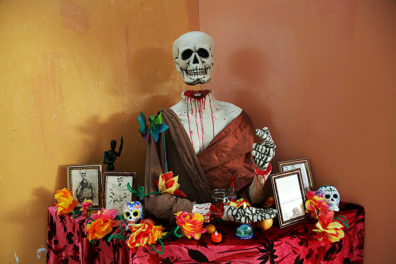 Although the intention was to return the objects to the queen, the traumatic events of the French Revolution intervened and that never happened. Marie-Antoinette was executed on October 16, 1793. 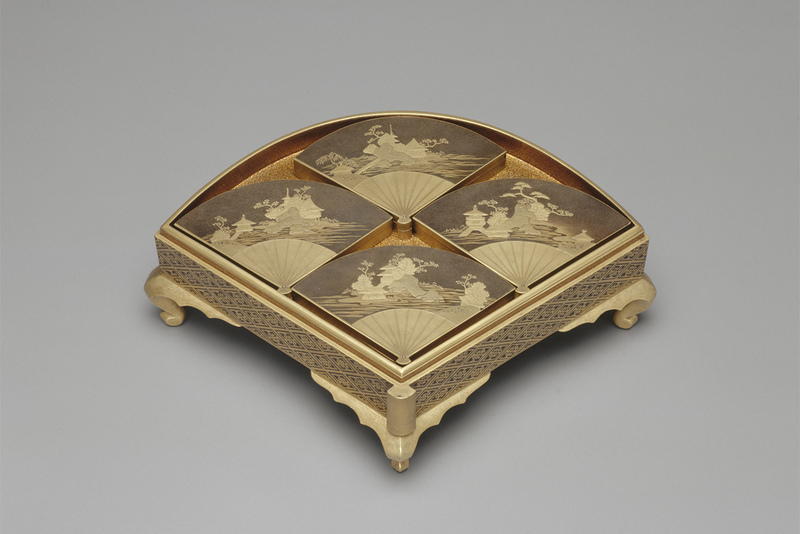 Her collection of Japanese lacquer remained in Paris with Lignereux and Daguerre. Five months later, on March 15, 1794, the Commission for the Arts of the new government ordered the items to be confiscated for the nation. It is remarkable that—literally at the height of the Reign of Terror during the French Revolution—these small golden boxes of Japanese lacquer were considered so beautiful and extraordinary that they were not sold or destroyed. Instead, they were carefully transported through the turbulent streets of Paris and safely deposited in the recently instituted Muséum central des Arts (the future Musée du Louvre), ironically the same building that had served as the ancestral home of the French monarchy. 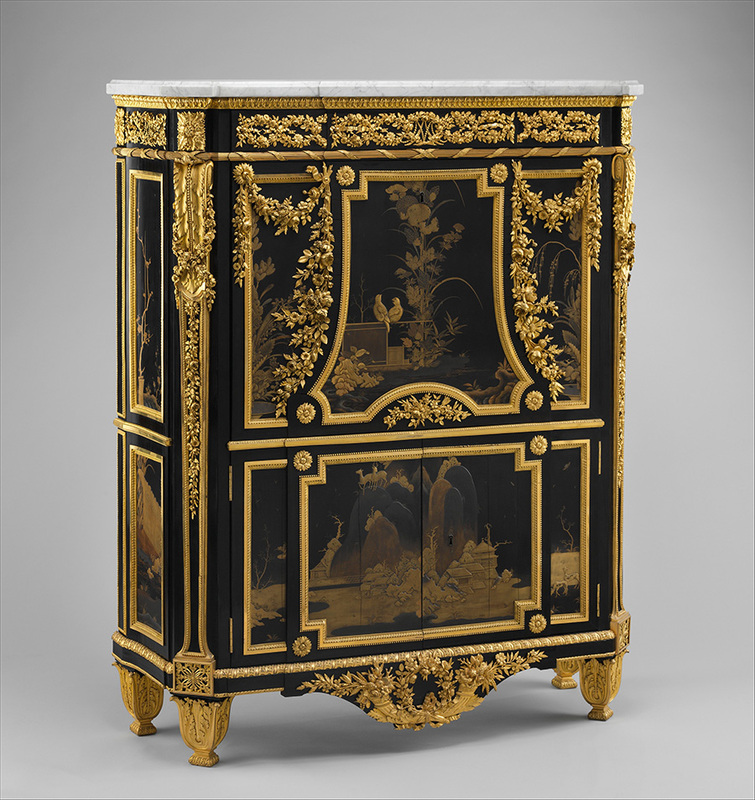 The dog-shaped box and low table have remained in the French national collections since the Revolution, along with the rest of the queen’s lacquer. All but a few of these pieces were transferred from the Louvre to the Musée Guimet (museum of Asian art in Paris) after the Second World War, and a large number—including the dog-shaped box and low table—were returned to Versailles in 1965. The entire group of lacquer constitutes a rare surviving example of an eighteenth-century collection that has survived intact to the present day. 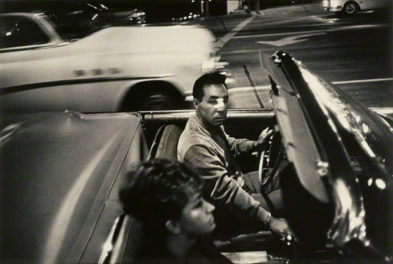 It is a great privilege to see a selection of these items on display for a time in Los Angeles. Fantastic story! Do we know what breed of dog this is! Unusual with all those spots. Hi Annemarie – I forwarded your question to Jeffrey. He thanks you for the compliment and says that he hasn’t come across any guesses at the breed.